There is something about pears that has always been alluring to me. It could be because I grew up with a yard with two generous pear trees, or I think of Janie from Their Eyes Were Watching God and her coming of age under the pear tree, or I think about its symbolic link with fertility. Maybe it is just because they taste so good! 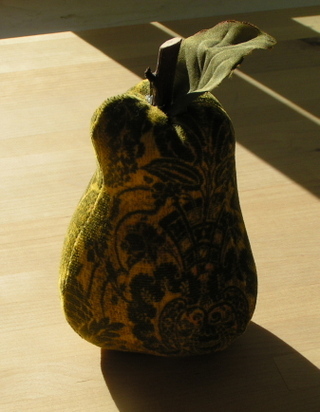 Stacy, the super-organized, talented sewer of Stacy Sews, makes these great pears and guess what? She had the pattern published in the Sew News Holiday issue. I got this lovely pear from Stacy's Etsy Shop. I was hoping to wait to post about this until I had made a pear but seeing as it is her birthday and all and I had the pictures ready, I am going with it. Happy Birthday, Stacy! Check out Stacy's site if you haven't already--you'll astounded at how much she can get done in a week. This is a Flickr badge showing public photos from SassyPriscilla tagged with pear. Make your own badge here. It's a beautiful pear! I'll have to look for that magazine as I have been reading about many interesting projects in it.